Sports and other entertainment are some of the few activities that unite people. 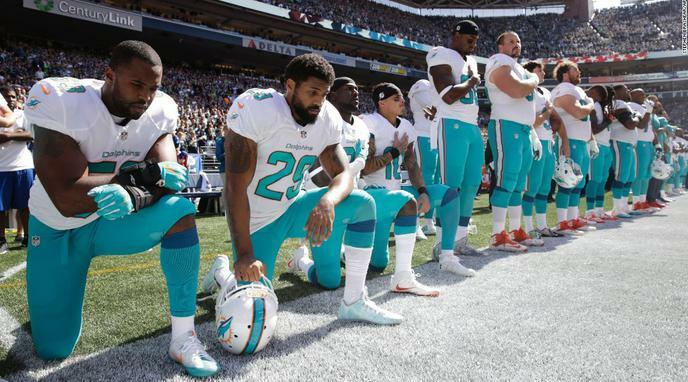 If the players stand, the sport is again uniting people. Patriotism binds the nation together. When people protest demonstrations of patriotism, they turn their back on the system that ensures we have these freedoms and create division among all people. There are more constructive ways to protest. The players are hijacking a game that everyone enjoyed. Forcing everyone to stand would only cause more disunity because those that supported kneeling would feel silenced by an already unjust government. Rituals and ceremonies don't create lasting, meaningful bonds. We bond when we talk and come together to solve problems. Kneeling has started us talking by pointing out a problem we need to solve. People can also unite to fight against systemic injustice. If the goal is uniting people, a better solution would be for NFL watchers to unite with NFL players to protest injustice. Unity isn't a worthy goal in a democracy. Standing during the national anthem doesn't affect the game itself in any way. If the sport itself is the activity that unifies people then only actions that impact the sport will impact its unifying effect.